Pictured is the vacant Swifty Gas station located at 473 S. Sandusky St. in Delaware. Pending City Council’s approval, the property will be transformed into a new Marathon station. 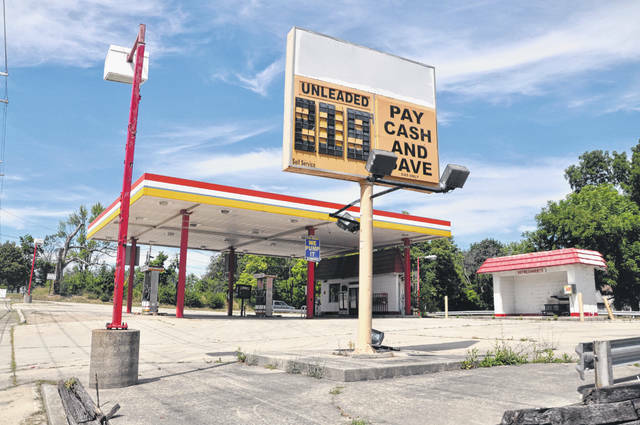 For years, the former Swifty Gas station located at 473 S. Sandusky St. in Delaware has been an eyesore to the community. After purchasing the building in 2014, N&G Takhar Oil LLC, located in Tipp City, will begin renovating the site to make way for a Marathon gas station. On Wednesday, The City of Delaware Planning Commission voted to recommend the proposed development to City Council for approval. Currently a 500-square-foot facility, the proposed redevelopment would extend the gas station to 3,800 square feet. The two existing pumps will be removed, and four new pumps will be installed. However, the footprint of the old gas station will remain the same in that no new pavement will be added to increase the overall size of the site. According to the developer, the existing fuel systems from the previous station are still in “good, working order” and will be salvaged for the new Marathon station. Asked whether or not the gas station would be open 24 hours, the developer said he didn’t believe so, saying the demand and traffic would ultimately decide the hours. He speculated an 11 p.m. closing time on the weekends, while an earlier closing time throughout the week would be appropriate for that particular area. The developer, who is also currently building a gas station on U.S. Route 23 and owns gas stations around Columbus, Dayton and Cincinnati, said, “We have a history of successfully completing these projects, along with the owner.” He expects to be able to begin developing within four to six weeks of final approval. City Council will discuss the proposal at Monday’s meeting.